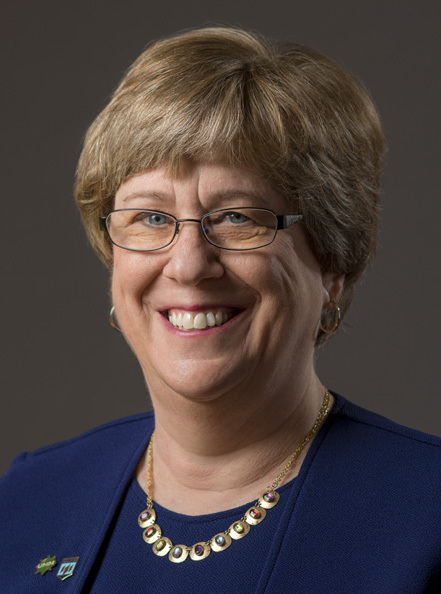 Joan Ferrini-Mundy is the president of the University of Maine (UMaine) and its regional campus, the University of Maine at Machias (UMM). Prior to joining the UMaine and UMM communities on July 1, 2018, she was the chief operating officer of the National Science Foundation (NSF). After receiving her Ph.D. in mathematics education from the University of New Hampshire (UNH) in 1980, Ferrini-Mundy was a postdoctoral associate there, and a visiting assistant professor in the Department of Mathematics at Mount Holyoke College. There she co-founded the SummerMath for Teachers program. She returned to UNH as an assistant professor of mathematics, where she rose to the rank of full professor. On leave from UNH, she served as director of the Mathematical Sciences Education Board at the National Academy of Sciences, and subsequently joined the mathematics and teacher education faculty of Michigan State University (MSU). There she also served as associate dean for science and mathematics education in the College of Natural Science and director of the Division of Science and Mathematics Education. At NSF, Ferrini-Mundy headed the Directorate for Education and Human Resources for six years before being named chief operating officer. Her distinguished career spans the fields of mathematics education, STEM education and policy, teacher education, and research administration. She has more than 100 publications and has mentored 10 doctoral students. Among her awards and recognitions are the U.S. Senior Executive Service Presidential Rank Award of Distinguished Executive, MSU’s University Distinguished Professorship, and election as a Fellow of the American Association for the Advancement of Science and of the American Mathematical Society. Currently, Ferrini-Mundy co-chairs the Organisation for Economic Co-operation and Development Mathematics Expert Group Programme for International Student Assessment 2021, and is a member of the National Academies Board on Higher Education and the Workforce. She is leading the development of a University of Maine System plan for research and development. Ferrini-Mundy serves on the boards of Maine Center Ventures, and Maine & Company, and is an ex officio board member of the University of Maine Foundation.